The People's Best New Chef - Vote Today! Click on the links below to read about the 100 amazing chefs we selected, then vote for your favorite in each of 10 different regions across the country. The chef with the most votes will be named The People's Best New Chef for 2015. 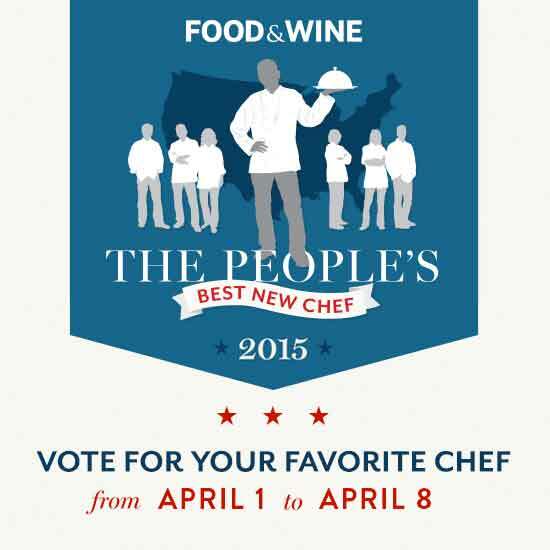 SouthwestVoting starts on 4/01/15 and ends on 4/08/15 at www.foodandwine.com/thepeoples-bnc. One vote per IP address per region. As determined by Time Inc. Affluent Media Group (TIAMG) in its sole discretion, votes from any automated means or intended to disrupt the voting process will be void and may subject vote(s) recipient to disqualification and/or the competition to termination. All votes subject to TIAMG’s verification. Chefs with the highest eligible votes per region will become regional winners (10 total). TIAMG is under no obligation to report any voting information, including, without limitation, votes, tallies, percentage of votes, and/or rate of voting, which information is proprietary to TIAMG. THE PEOPLE’S BEST NEW CHEF® title will be determined based on highest number of eligible votes received during the voting period irrespective of region.